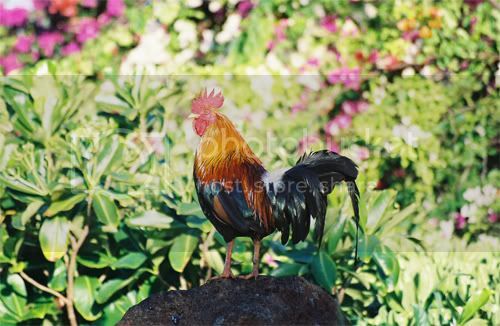 this proud and strong rooster. He's a handsome devil, is he not? My e-mail inbox is in a ridiculous state right now. It is overflowing with so many encouraging e-mails, and I have been at a loss for how to respond to them all yet. Okay, since I wrote those first two sentences, nearly three hours has passed. I was miraculously inspired to respond to every single one of the e-mails I received to encourage me through this cancer thing with which I've suddenly got to deal. I was so very inspired and encouraged and grateful that I took quotes from them and posted them below with links to their websites, where applicable. That's right, I took quotes without permission from personal e-mails and am arresting my readers of their privacy. I must be evil, except that I am totally not, because I want to show my gratitude for all the kindness this here internet has shown me over the last few days. You intertubers truly know how to make a gal feel loved. I would also like to thank Ozma, Miscellaneous Mum, and Alice for thinking of me in their posts. I send all the love back at you, people. Your words of encouragement in both my comments sections and through e-mails have truly surrounded me with a strength that I don't think I would have had without you. Thank you.